Strike Squad coach Everald Cummings talks to Earl Best about what he felt on November 19, 1989, what he feels now and how he has been treated. Bitterness does not enter the picture when Strike Squad coach Everald “Gally” Cummings discusses the events of November 19, 1989; when he looks in his rearview mirror, he sees the whole as a positive rather than a negative experience. 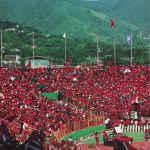 He insists, therefore, that he does not want to be a part of any “witch-hunt.” But he is pained by what has happened with the Soca Warriors. And more than anything else, that makes him quite certain that the thousands of ordinary Trinbagonians who supported him all along the road to that fateful day – and after! – need to find out what really happened 25 years ago. So he has one final story to tell; it concerns the penalty that never came. Two minutes before Caligiuri’s line-drive dipped out of Maurice’s reach, Philbert Jones was hacked down in the area. As the striker went to ground, the USA players held their collective breath. But the Argentine referee, Juan Carlos Loustau, waved play on. America exhaled, Joao Havelange, Chuck Blazer and Warner breathed huge sighs of relief and Jones scrambled back to his feet to contest possession of the ball. I always imagined Cummings at that moment yelling at his player to stay down, stay down! Wrong! 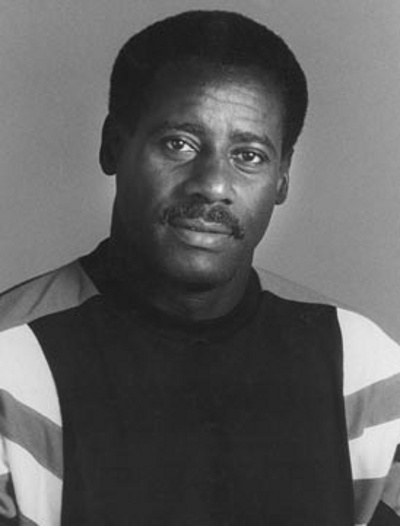 Photo: Former Trinidad and Tobago national stand-out footballer and coach, Everald “Gally” Cummings. He says that in that split second he remembers remembering that the Argentinian referee had not originally been carded to officiate in this game; a couple of weeks before, FIFA had declared the game “high-risk” and announced that Señor Loustau would replace Venezuela’s José Vergara Guerrero, who, in normal circumstances, would have carried the whistle on the day. 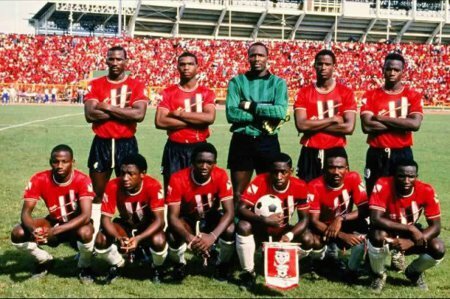 Photo: Trinidad and Tobago’s famous 1989 “Strike Squad”. Pressed for more, Gally explains. He laughs but you can tell he is not amused. “I didn’t understand,” he goes on. “He explained. The first Round Three game was on March 19 but our first game in that round was almost two months later on May 13. So we were still in training mode while the other teams were already in playing mode. “And then he asked me two questions I could not answer: Why were there almost six months between the away game and the home game against the USA? Check the fixtures. One was in May, the 13th, I think, and the other one on November 19th. “After we beat Guatemala 2-1 at the National Stadium in early September, why did we have to wait more than two months to play our last game against the USA on November 19th? We had no answer; Gally declined to share his. He did, however, offer an answer on how the Strike Squad might have fared in Italy 1990 against the hosts, Austria and Czechoslovakia. 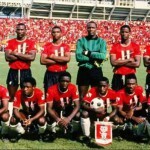 Russell Latapy’s cameo in the last quarter of the Paraguay game allowed us a fleeting glance of what he, with help from Lancelot Layne, had had everyone calling “Kaisoca Soccer,” the genre embedded in the Strike Squad survivor’s DNA. And he declined to conclude that his players would have given a better account of themselves than the Soca Warriors did versus Sweden (0-0), England (0-2) and Paraguay (0-2) 16 years later in 2006. Looking back at his playing and coaching days as a whole, Gally does not think that, all in all, Trinidad and Tobago has treated him unfairly. Wherever he goes in the country, he consistently gets the love and respect he has earned and which others so clearly crave. And which some are prepared to use their abundant resources to attempt to buy in the political marketplace. Interestingly, although Warner was the only major player not to get any national reward for his albeit key role in getting the Soca Warriors to Germany, Gally doesn’t think that the country has been unfair to the now out-of-favour Special Adviser either. But, says the Strike Squad coach, neither the TTFA/TTFF nor its erstwhile secretary who rose to become a FIFA vice-president has ever given him his due. 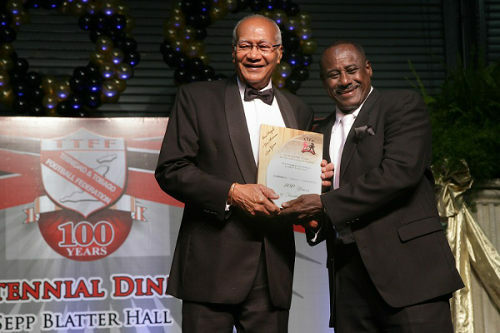 Photo: Former Trinidad and Tobago stand-out player and coach Everald “Gally” Cummings (right) is recognised by former President Maxwell Richards at the TTFF Centennial function. One should note, he adds, that neither the Strike Squad coach nor its members are thought to have earned the right to attend national team games free of charge. 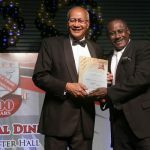 Since 1989, only once has the country’s most successful local coach and the only footballer ever to win the Sportsman of the Year award attended a T&T match on a complimentary ticket. For the Ash Wednesday2005game versus the USA at the Oval, his public servant wife received a pair of free tickets from her employers. A decade later, in the run-up to the 2001 World Youth Cup,when everyone agreed that Chief Adegboye Onigbinde was simply not getting the best out of the national under-17 team, Cummings’ former employer, the Ministry of Sport, summoned him via telephone to come and take over the squad. All packed and ready to fly in from the USA where he was living at the time, Gallygot a second call from his close friend from boyhood days, Russell Tesheira, a teammate from the 1973 squad and at the time a representative of the team sponsor, Clico, congratulating him on his appointment. Days later, a third call came. 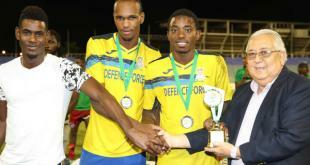 The Ministry official apologised because “Jack Warner has hired the Brazilian who coached Jamaica, René Simoës,” to replace the Nigerian. Gally’s caller, he says, never used the word “single-handedly” or “unilaterally” but he left no doubt in Gally’s mind that it was a decision on which the TTFF had not been consulted. A year later, still resident in the USA but back home, Gally was watching a national under-20 practice match. Concerned that the team, in training for an international tournament, was playing well below its potential, he offered his services to then TTFF president, Camps. As luck would have it, moments later, Warner joined them in the room and the conversation. 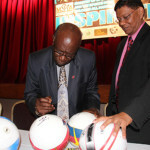 Photo: Former FIFA vice-president Jack Warner. Advised by Camps that Gally had expressed a desire to handle the Marvin Lee-captained side, Warner did not hesitate for a second. Doh involve me in this one Gerry. Lol! If yuh eh believe me, ask Debbie. Me, be nice? But am I not always? Brent Bennett and Gerard Emile Zatopek Pinard be nice… The man is unwrapping his anguish. Suspicions, conspiracy theories and all.